I am so excited to have Ruthie from What’s Cooking with Ruthie here today to share a recipe that is PERFECT for Valentine’s Day! She is an absolute doll and her blog is filled with delicious food. I know you are going to love her and the yummy recipe she has brought to Chef in Training today! Without further ado, I will let her take it away now. Hi to all of Chef in Training’s friends! I’m Ruthie from What’s Cooking with Ruthie.com and I’m so excited to be guest posting here today… I’ve been in the mood to share a little of that Valentines love around! AND what better way than by baking something in the kitchen? Combine flour, cocoa, baking soda, salt, in a medium sized mixing bowl; mix well. In a large mixing bowl combine butter, cream cheese and sugar; beat until light and fluffy. Add eggs one at a time; beating well with each addition. Add sour cream, food coloring, vanilla; mix well. Add dry ingredients 1 C at a time; mixing well with each addition. Mix just until incorporated. In a mixing bowl combine cream cheese and butter; mix well. Add powdered sugar 1 C at a time; mixing until incorporated with each addition. Using a 1M Wilton Star tip and a large piping bag; begin piping at the outer edge and circle frosting into the center. Thanks so much for letting me share some fun Valentines Baking ideas with you all today… I hope you’ll come and visit me at www.whatscookingwithruthie.com I’d love to have you stop by :) Or connect with me: Facebook, Twitter, or Pinterest ! And a super big thank you to Nikki for having me guest post today… I love her site and all of her amazing cooking skills! I love those cupcake cups! Gorgeous cupcakes and love the from-scratch recipe. Thank you for sharing it! What adorable cupcakes! I love the little cups you have them in!! So cute!!!!!!!! 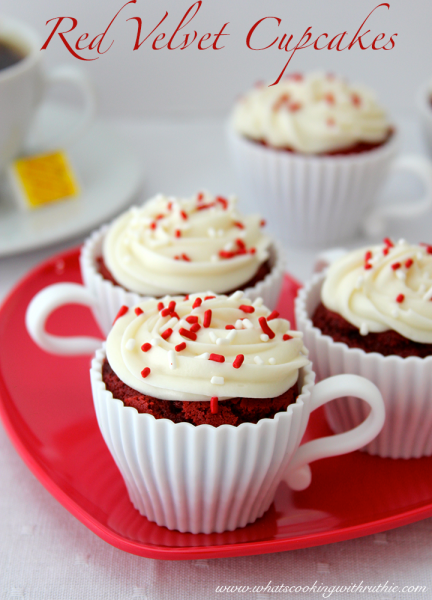 these are so so adorable....and who doesn't love red velvet! These are so adorable! I love the white teacups and the cupcakes sound delicious!